Im a newbie to this, so I was messing around with a tutorial about what to do after installing antergos, I installed LTS kernel, then I used sudo pacman -Rs linux, but now that I try to boot it says I need to load the core first. I dont know what to do, cant find lts kernel either on advanced options. , you need to generate initramfs. and 2nd wrong is, you removed directly the linux kernel. you need a usb-disk of antergos to get back in. So is linux. Flagging “out of date” only means the new kernel versions are released by Linus & his colleagues, but not yet finished and released by Arch. 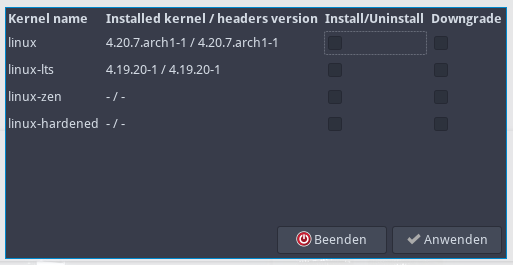 Arch releases new kernel versions quite rapidly compared to nearly all other distros.